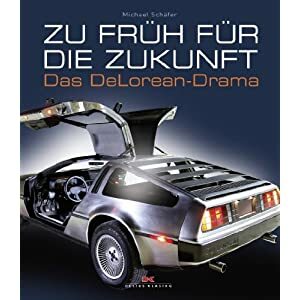 It's available only in german so far, but I expect you to understand most of it. If you're interested to get in touch with the author - let me know. Or did you even talk to him ? I know he talked to many further employees. Filmmaker, "Delorean - Living the Dream"
Nick - this is really fantastic! I can't wait to read the rest... Keep up the great work! why the Government of the time took the risk, has never clearly been explained. One of the key elements that inspired me to write the book was to set the record right. That is what I like to read. I am much more willing to read and accept this from someone who was actually there. Even from the very beginning to the very end. Of course I bought that book "Zu früh für die Zukunft" I speak fluently German, but is very hard to read this book in German. If it comes out in English I will buy a new copy. I have not finished it yet. So I need to hurry up so I can read Nick's book. Can I put it on my Christmas list for 2012? Last edited by Dangermouse; 01-05-2012 at 09:40 AM. But it would be twenty years before I summoned courage to watch the film. Until then I wouldn’t allow my dream to be shared or stolen by anyone, film watcher, car owner or enthusiast. How could the pop corn audience understand the energy, determination and passion that resulted in the birth of the car named DeLorean? I love this perspective, as I share it. Although I understand the affection of the Delorean/BTTF relationship, the BTTF aspect was a mere footnote in the history of the car after the fact. The Delorean history itself is what truly entices me, and the fearless vision even inspires me. I am obviously a fan of the car, but a fan of the story behind the car just as much. Nick, I would like to offer my services as an illustrator if you like. Last edited by Michael; 01-05-2012 at 09:11 PM. The BTTF has as much a as a foot-note value to the true story as the drugs. Just hope they remain a footnote. Nick, I just want to say that when this book hits the shelves, I will be there to scoop it up too. I loved that preview chapter and could feel the emotion that obviously exists in this work. I cannot wait, as with the others who have already posted before me, to read the completed book. Until then, I wait with eager anticipation. The next stage in completing the book is to refine the words and tell the story with a readability factor without distorting the facts. This really is the difficult part. Please have patience – I’ll get there. I 've spent three years researching the detail to ensure the accuracy of the story .This part of the project is complete and there is a significant amount of detail to tell. I’m confident that the reader of the completed work– DeLorean owner or otherwise -will take an interest in our little miracle at Dunmurry and the stories that unfolded before, during and after we stopped new car production. The programme took over the lives of many people – I’m not alone in that category. Many of the young stars went on to bigger and greater things in Industry. For many others unemployment for many years was their reward for dedicating themselves to the achievement of the impossible. The life of the manufacturing programme was only 12 months , we were in Receivership for about the same period of time. The book covers the period 1978 to 2005. Please remember that without the movie BTTF our profile as a group of enthusiasts would significantly less than that it is today.It’s played a major role in keeping the image of the DeLorean Car alive. When I finally got around to watching the film – my first action was to check the shut lines on the doors and hood. After all those years you’d think it didn’t matter any more – but it does. Thank you for sharing this chapter Nick.